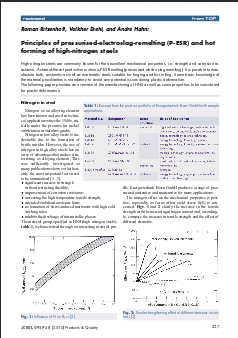 High nitrogen steels are commonly known for their excellent mechanical properties, i.e. strength and corrosion resistance. A state-of-the-art production routine is P-ESR melting (pressurised electro slag remelting). It is possible to manufacture both, austenitic as well as martensitic steels suitable for forging and hot rolling. Some basic knowledge of the material peculiarities is mandatory to avoid any potential issues during plastic deformation. 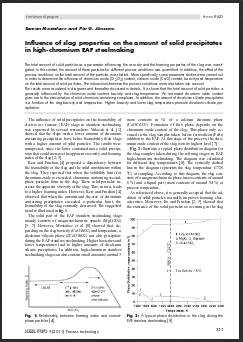 The following paper provides an overview of the manufacturing of HNS as well as some properties to be considered for plastic deformation. Corrosion behavior of 19Cr-18Mn-0.69N austenitic stainless steel was studied by cyclic polarization technique in 3.5 % NaCl solution and was compared with that of other austenitic stainless steels having different compositions namely, AISI 316L and one with 14 Cr and 8% Mn, denoted 14Cr-8Mn in the following. The results showed that 19Cr-18Mn-0.69N austenitic stainless steel exhibits higher pitting resistance compared to that of other two alloys. SEM micrographs of 19Cr-18Mn-0.69N austenitic stainless steel after corrosion showed no pits at the alloy surface even when it was polarized beyond transpassive pitting potential. However severe attack was seen at the araldite-metal interface. But, in case of AISI 316L and 14Cr-8-Mn severe pitting attack was seen at the surface, whereas no attack was seen at araldite-metal interface. Critical crevice temperature for the three stainless steels was determined. 19Cr-18Mn-0.69N austenitic stainless steel was found to have good crevice corrosion resistance compared to other alloys investigated. The total amount of solid particles as a parameter influencing the viscosity and the foaming properties of the slag was investigated. In this context, the amount of these particles for different process conditions was quantified. In addition, the effect of the process conditions on the total amount of the particles was studied. More specifically, some parameter studies were carried out in oder to determine the influence of chromium oxide (Cr2O3) content, calcium oxide (CaO) content, basicity and temperature on the total amount of solid particles. The interactions between the process conditions were also taken into account. P91 steel is also known as modified 9Cr-1Mo (P91) steel is widely used as a structural material in the construction of power plant components. In high-Cr ferritic steels, toughness degradation in welds was caused by the presence of δ-ferrite phase in the martensite matrix. The δ-ferrite phase formation is influenced by factors such as chemical composition of welds, Creq and Nieq , heat input used during welding. As the δ-ferrite phase content increases there was reduction in toughness of welds below the specified requirement of 47 Joules as per the standard EN1557: 1997. The poor toughness of welds having δ-ferrite phase can be improved by prolonging the PWHT duration at 760°C. Flux system of consumables also influences the toughness of welds. Basic flux system produces welds having higher toughness than acidic flux system. This is due to microinclusion content of welds. The flux basicity, V and Nb content, and ferrite factor are interrelated and presented as a line diagram. The present study discusses about the role of chemical composition, and welding processes (SMAW and FCAW) on the formation of δ-ferrite phase in welds and its influence on toughness of welds. Rare earths (RE) have been used to improve the high temperature oxidation resistance of low alloy steel containing elements like Cr, Al, V and Mo. Further, the RE can be added either to the alloy or by applying as an oxide coating to the alloy surface. In this study the high temperature oxidation resistance of rare earth (RE) oxide coated 1Cr-0.3Mo-0.25V alloy was determined. This paper presents the influence of surface additions of nano-crystalline oxides CeO2 on the isothermal oxidation behavior of 1Cr-0.3Mo-0.25V alloys at temperatures ranging from 600 °C to 900 °C. The oxidation rate of RE oxide coated1Cr-0.3Mo-0.25V was significantly lower than that of the uncoated alloy. The improvements in oxidation resistance are the reduced oxidation rates and the increased oxide scale adhesion. Scanning electron microscopy (SEM), X-ray diffractometry (XRD), and electron probe micro analyzer (EPMA) were employed for these analyses. The scale formed in the presence of RE oxides was very thin, fine grained and adherent.